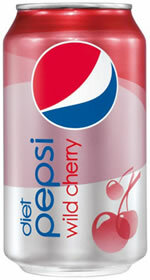 Diet Pepsi Wild Cherry is a zero calorie soft drink produced by PepsiCo. It has slightly more caffeine than regular Diet Pepsi. It is artificially sweetened with aspartame and ace-k.
How Does Diet Wild Cherry Pepsi Compare? Diet Wild Cherry Pepsi contains 3.17 mgs of caffeine per fluid ounce (10.71mg/100 ml).